The only Porsche 911 GT1 Evolution racecar to have ever been adapted for road use is to go on sale at RM Sotheby's upcoming Monaco auction. The 1997 model, lot number 261, is to be auctioned on Saturday May 14 and is expected to sell for between €2.7 and €3 million – that's £2.1 - £2.32 million. The incredible price isn't just due to its unique road-legal specification. 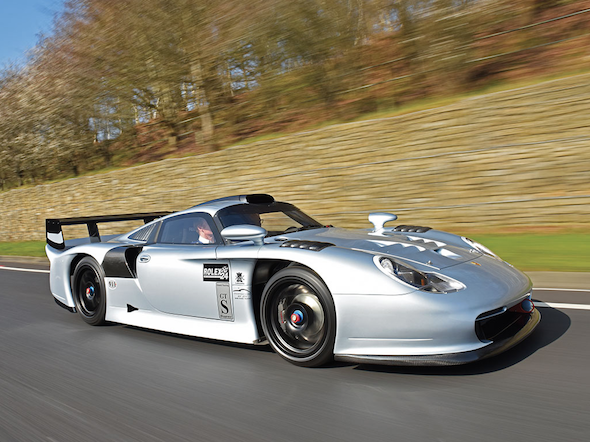 The 911 GT1 is an incredibly rare car in its own right – only 18 racecars and 23 'Straßenversion' road cars were ever built. Boasting the 911 993's front end and a 3.2-litre twin-turbo, water-cooled flat-six engine, mounted in the middle of a tubular steel chassis, the GT1 puts out over 600hp – which was enough to give this model reasonable success with privateer team Bytzek in North America in the early 2000s. Since its restoration, the GT1 has been run for less than two hours. The two-owner model appeared at the 2015 Goodwood Festival of Speed alongside Porsche's Le Mans-winning Type 919 Hybrid. Up for public sale for the first time in Monaco, the only road-legal GT1 racecar is accompanied by a comprehensive file of restoration invoices and photographs as well as factory documents and shop manuals. A selection of spare parts is also available by separate arrangement.